In the recent article, "Inferring Artistic Intention in Comic Art through Viewer Gaze," the authors examined whether people's eyes are more directed to parts of comic panels than they are when looking at other types of visual phenomena (particularly photos). The aim of the study was to investigate the claim among comic artists "that the artist is able to purposefully direct the visual attention of readers through the pictorial narrative." 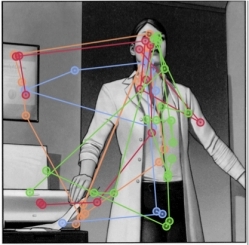 The authors used an eyetracking device to measure where people's eyes look when they are reading individual comic panels (as opposed to across a whole page), as well as photographs taken by experts, amateur photographers and a robot. 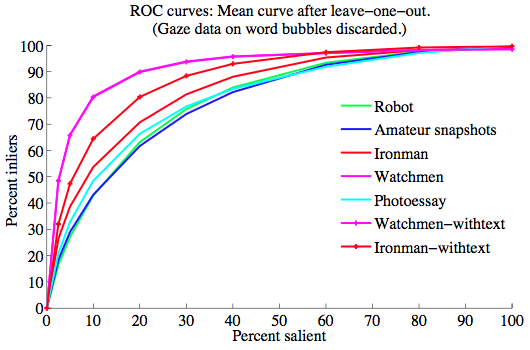 They found that participants had far more directed and consistent eye movements towards specific portions of comic panels than were found for photographs, where gaze was far more general. They suggest that these findings show that comic panels direct the flow of attention of their readers. I am not sure that these findings fully support their goal to see if "artists purposefully direct the visual attention of readers through the pictorial narrative." This is a fairly vague hypothesis (direct visual attention to what? To the whole image? What does that mean?). For full evidence of this hypothesis, they would need to see the relationship between eye movements across a larger page layout with those in individual panels, assuming that this is what they mean by directing a reader's attention through the narrative. What's appealing about these data though is the idea that panels—being created to be in sequence—hone a reader's attention to specific parts of panels over others. This is an important finding, and invites follow up experiments that might better explore just what portions of panels might be important or not for the comprehension of a sequence. However, there are some limitations of their design that may make their overall conclusions a bit premature. My fear in the comparisons they make is that the compared stimuli are not equivalent or counterbalanced appropriately. For example, they use comic panels from Watchmen and an Iron Man book that likely depict figures and actions. In contrast, the photos taken by amateurs were of a variety of topics both of figures and places (online photo albums). In contrast, the robot's photos were almost entirely of static environmental information about the interior of a building. These comparisons in subject matter are not equivalent in their subject matter. More equivalent stimuli might be able to ask: Would photo versions of panels (as in a photo novella) elicit the same types of eye movements as those in drawn panels? What if the photos also showed figures engaged in actions instead of places)? How are eye movements of comic panels different from other artwork or film shots (where all are designed, but only comics and film intentionally have a sequence)? It seems that these would be more equivalent comparisons, otherwise it seems like comparing apples and oranges: the stimuli are totally different from each other in nature to begin with. The more important comparison shouldn't be comic panels vs. photos, it has to bear in mind the content of those images.